CHICAGO, IL – January 2018 ­– Registration is now open for the 50th edition of NeoCon, the world’s leading platform and most important event of the year for the commercial design industry. 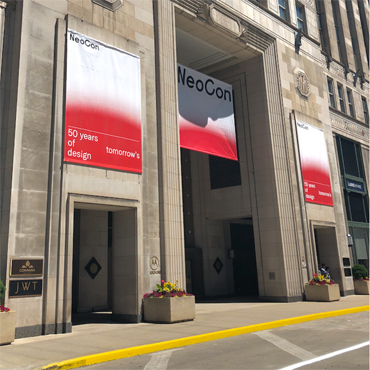 NeoCon 50 will take place from June 11-13, 2018 at The Mart in Chicago. Since its launch in 1969, the show has served as a launching pad for iconic brands and products in the commercial design world. Furthermore, NeoCon has evolved into an international design hub that brings together more than 50,000 professionals for networking opportunities as well as dynamic and diverse learning experiences. Its powerful conference program is at the forefront of thought leadership, delivering distinguished speakers, ideas and innovations that are shaping the global landscape of workplace, healthcare, hospitality, government, education, retail and more. This year’s marquee presentations will feature a series of headliners addressing the future of design and the industry. Special events will include inspiring retrospectives and a festive NeoCon 50 party on Tuesday evening. NeoCon partnered with an award-winning creative agency, Maiarelli Studio, to develop a new campaign and an updated logo that aligns with NeoCon’s design expertise and position as a market leader. 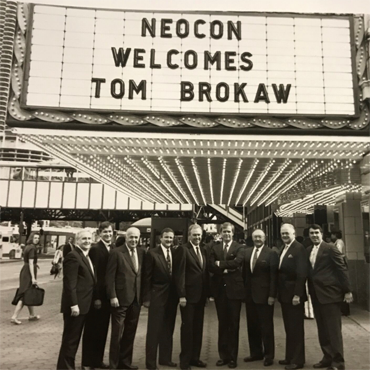 It also has launched the NeoCon blog, which will include exclusive one-on-one conversations with industry notables as well as interesting and entertaining history about the people, products and parties that made up the first 49 years of NeoCon. Looking back, NeoCon’s future wasn’t always so certain. In 1967 a fire destroyed Chicago’s McCormick Place building, the original site of the first NeoCon (then known as INTERCON I). Recognizing a “vital and compelling need for a truly international contract convocation,” the Merchandise Mart came to the show’s rescue. Held on June 25, 1969, the inaugural edition attracted nearly 10,000 architects and designers who were looking for a merchandising and educational platform. According to Byron Morton, Vice President of Leasing for the Mart, “Our foundation is built on the highest standards and on presenting, what W.O Ollman, then Mart General Manager called, ‘the most extensive and representative selection of contract goods ever assembled under one roof.’ He also stressed the importance of programming that will bring ‘outstanding spokesmen from all parts of the world’. This has been a winning combination since the beginning and is an essential piece of the show’s DNA. 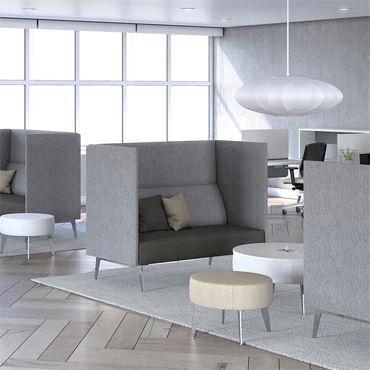 NeoCon 50 will celebrate the show's rich tradition and continue to explore the future of commercial design and business trends." Occupying floors 1, 3, 10, 11 and the 7th Floor Exhibit Hall of the Mart, the 50th edition will feature 500 companies including heavyweights such as Herman Miller, Knoll, OFS Brands, Shaw, and Steelcase as well as new showrooms from Scandinavian Spaces and NappaTile. New exhibiting companies on the 7th floor exhibit hall will feature a number of international companies including Narbutas Furniture Company (Lithuania), DeVorm (Netherlands), Polarmoss USA (Finland), Luceplan USA (Italy) and Lovair (UK). Four marquee presentations include panels, talks and keynotes and will explore hot topics such as the integration of technology and design, as well as the struggles and victories of women in the industry. Details will be announced in February. NeoCon is open to trade, media, C-Suite executives and other industry-related professionals. The redesigned NeoCon 2018 website and complimentary registration is now live at www.neocon.com. On-site registration: $40. Marquee/Keynote presentations: Free. CEU seminar details and registration will be available March 6.